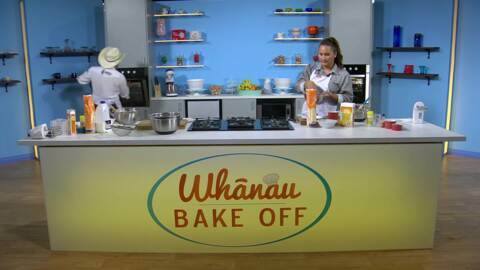 Join host Kahurangi Maxwell on Whānau Bake Off for exquisite kai and friendly whānau competition. 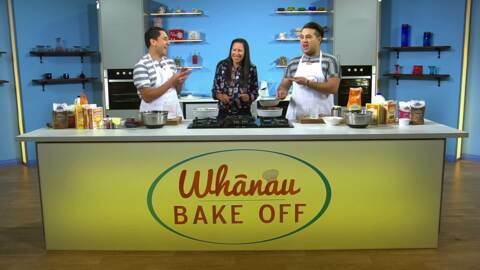 Amazing bakers share their finest recipes, tastiest dishes and most useful baking tips but who will win the whānau bragging rights? Fit and fabulous couple Lisa and Jason take a break from parenting and police work to bake off against each other with a favourite recipe. Executive Chef Nancye Pirini joins in on the fun. 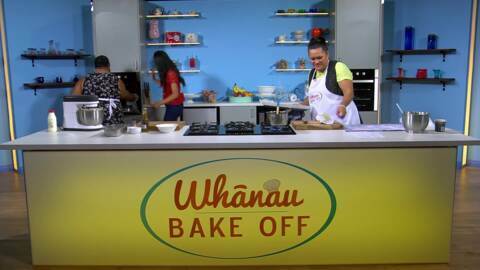 The brand-new baking show that pits husband against wife, mokopuna against nanny in a battle for whanau bragging rights with celebrity guest judges. The talented twosome Wiremu and Awhimai battle it off. 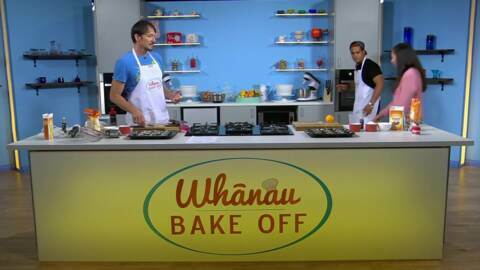 Awhimai has more baking experience but Wiremu has some tricks of his own. Adding to the fun is the flockingly fabulous Luke Bird. 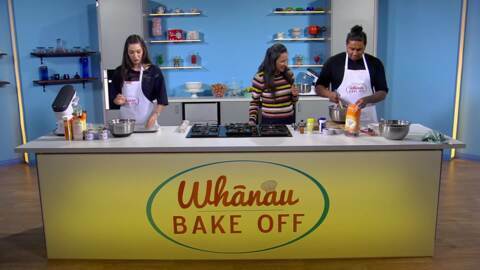 It’s a bake-off of two halves today with professional rugby players, Portia Woodman and Renee Wickliffe in the kitchen. International chef presenter Robert Oliver judges the outcome and shares a very tasty tip. Loveable cousins Pera and Iri have spent many happy hours cooking together for their whānau and marae. It is up to baking goddess Natalie Oldfield to decide who takes the win. 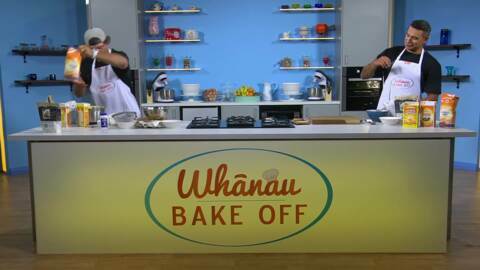 We’ve got a double serving of funny as Matariki Whatarau and Cohen Holloway test the limits of their friendship, and their kitchen skills, as they bake off for bragging rights. Chef Monique Fiso joins in on the madness. Game of Bros boys Josh and Jesse don’t have a lot of baking experience but they make up for it with slick dance moves. Delaney Mes lets us in on a handy trick to make quick and easy pastry. Shelly and Zia treat us to a Northland showdown as they swap glasses of bubbles for baking mits. Writer, food judge and baker extraordinaire Natalie Oldfield joins us once again to pick the winner. It’s all about whānau as father and daughter, Clarry and Ebony, compete against each other with a family favourite. Robert Oliver is our judge and shares a delicious Pacific Island treat. Pere Wihongi and Tūhoe Tamaiparea are Poi Pro’s, Kapa Haka Queens and Netball Naturals – but they reckon their baking skills are a bit rough. Luckily Delaney Mes is on hand to help. Husband and wife team, Anthony and Kathy Dunn won Marae Kai Masters as a team but today, they’re pitting their competitive natures against each other in an epic bake off. 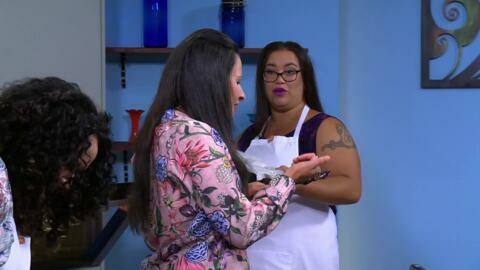 Monique Fiso is called in to judge. It’s all about the bro’s as brothers Matua and Reuben Parkinson swap rifles and catch bags for spatulas and oven mits. 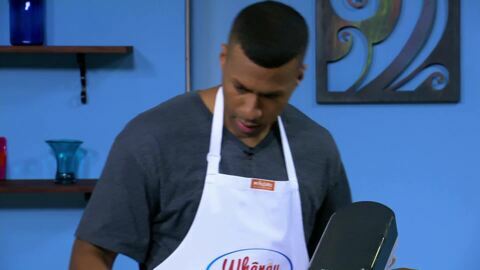 Cameron Petley of Cam’s Kai chooses the winner and imparts a few handy baking tips.